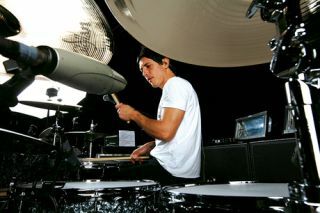 Brit-rockers Stereophonics have parted ways with drummer Javier Weyler. Brit-rockers Stereophonics have parted ways with drummer Javier Weyler. The news was delivered by the band themselves via their official Facebook and Twitter pages on the 20 July. A statement from front man Kelly Jones and bassist Richard Jones stated: "We wanted to let you know that Javier and the band will no longer be working together. The band enjoyed playing with Javier over the last eight years and his company was enjoyed by everyone in the Sterophonics family. We wish Javier every success going forward in his new creative endeavours and personal life." There is no confirmation yet as to who will be replacing Javier behind the kit, with the band hinting that, "Filling in temporarily for Javier on these next shows will be our friend Sam." The band play shows on the following dates: (22 July) Llandudno Venue, (23 July) Derby Assembly Rooms, (24 July 24) Grimsby Auditorium, (25 July) Cambridge Corn Exchange) and London Hyde Park (27 July).